An extremely gifted footballer with the ability to produce the unexpected quickly made Mick Dagless a firm crowd favourite at Croft Park throughout the 70’s. Dago as he was known to his teammates, was a regular name on the score-sheet and eventually ended his 8 year trophy laden Spartans career with an impressive 93 goals from midfield. A free scoring midfielder with an eye for a spectacular goal, he was the creative lynch-pin of the team who was attributed with the hardest shot in the Northern League. Born in Norfolk, Mick’s family moved to Peterborough when he was aged 11 and his performances for his school impressed scouts from Peterborough United. He was soon representing ‘The Posh’ in youth sides and later played a couple of games for the Reserves as well as being capped by England Schoolboys. However his academic interests put pay to his time at ‘The Posh’ when Mick moved to the North East at the age of 18 to study Chemistry at Newcastle University. It was while playing for the University’s first team in the Northern Combination League he first came to the attention of Blyth Spartans, in November 1968 the students came to Croft Park in the 1st Round of the Northumberland Senior Cup and caused a major upset. Belaying their lowly league placing Mick starred as they dumped the manager less Spartans out of the cup with a shock 2-0 win. Mick continued to attract attention with his performances and it was no surprise when he was snapped up by FA Amateur Cup winners & Northern League champions North Shields in summer of 1969. A youthful Mick (front row 2nd right) with his North Shields teammates. 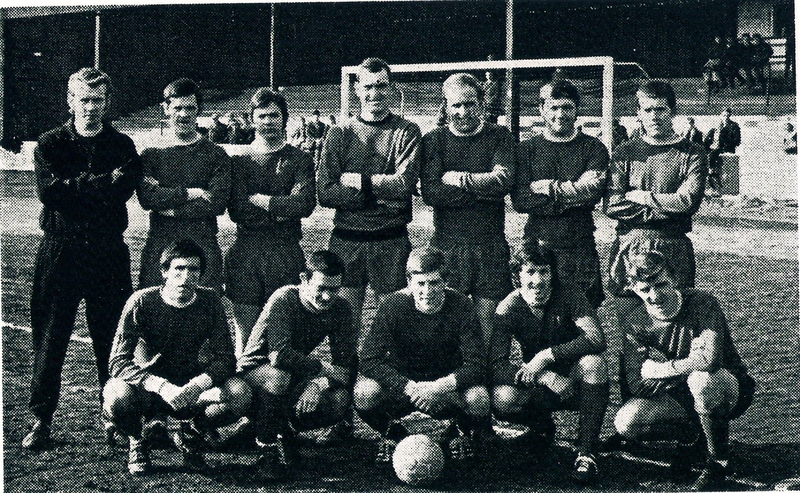 Future Blyth keeper Mick Morgan is back row centre and the prolific former Spartan Tommy Orrick is on Mick’s right. His continued to impress and attracted the scouts of several league clubs to Appleby Park, most notably the best team in the land; Liverpool. For a player who possessed guile, vision and technical ability in abundance, the step up to a higher level would surely not have troubled Dagless. 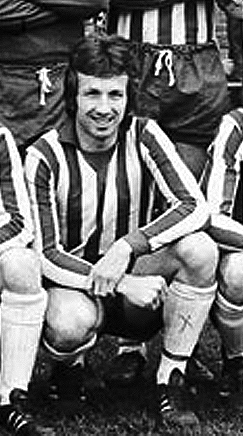 Mike became an established member of the North Shields side and over the next 3 seasons made 147 appearances scoring 42 goals, his performances had caught the eye of acclaimed Northern League manager Billy Bell, who had been appointed to the Croft Park hot seat in the summer of 1972. “I was always impressed with the condition of the pitch at Blyth. It was nice and wide and excellent for players who liked to pass the ball. I felt I could express myself better on a good playing surface”. When Mick came to Croft Park in September 1972, he arrived with a unique honour already in his trophy cabinet. Many footballers have played for the club having had extensive League experience and many honours from time as professionals, however Mick’s arrival brought a 1st for the club: a player who had a European Winners medal!. Mick had played in and won the European Amateur Cup for North Shields in his very first season!. In beating Sutton United at Wembley the Robins qualified as England’s representatives for the Coppa Ottrino Barassi – the European Amateur Cup. 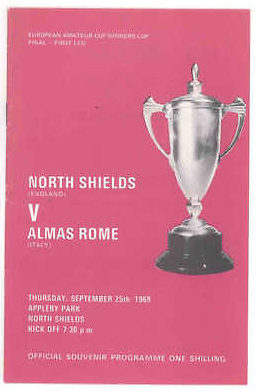 Shields took on Alamas Rome, the first leg on 25th September 1969 at Appleby Park in front of a 3,100 crowd who saw Jon Rutherford put the Robins 1-0 up. Ray Wrightson, Tony Cassidy (Tommy Orrick), John Rutherford. The 2nd leg was played in the Stadio Flaminio, which had staged the football Final of the 1960 Summer Olympics. The Robins fielded the same side from the 1st leg but the Italians, who played in the 7th tier of Italian league system, reversed the score line and ran out 2-0 winners. The aggregate score was 2-2 so with both teams having no away goals the tie was classed as drawn with both team sharing the trophy, however it wasn’t an outcome that had been thought of and their was only 1 set of winners medals!. FA Secretary Denis Follows, who had helped organise the tie and the trip to Rome for North Shields, got together with his Italian counterpart and both clubs Secretaries decided it would come down to a ‘toss of the coin!. Shields captain Ron Tatum called correctly and the Robins players came home with the winners medals and they got to hold the trophy 1st before it was returned to Almas for their turn. to be contested solely by the winners of their respective countries’ domestic amateur knock-out tournaments the FA Amateur Cup and the Italian Coppa Italia Dilettanti, the tie was played over 2 legs. Leytonstone F.C. were the first champions of the competition in 1968, winning on the away goals rule having drawn 1-1 at home they drew 2-2 away to Stefer Roma. 1970 – Enfield won the trophy beating Ponte San Pietro 3-0 at home, losing the away leg 1-2 to win 4-2 on aggregate. 1971 – Skelmersdale United won 2-1 on aggregate after a 2-0 home win followed by a 0-1 defeat to Montebelluna. 1972 – Hendon claim the trophy beating Unione Valdinievole 2-0 at home then drawing 1-1 away to win 3-1 on aggregate. 1973 – Walton & Hersham beat Jesolo 4-0 at hoem then 2-0 away to claim a 6-0 victory. 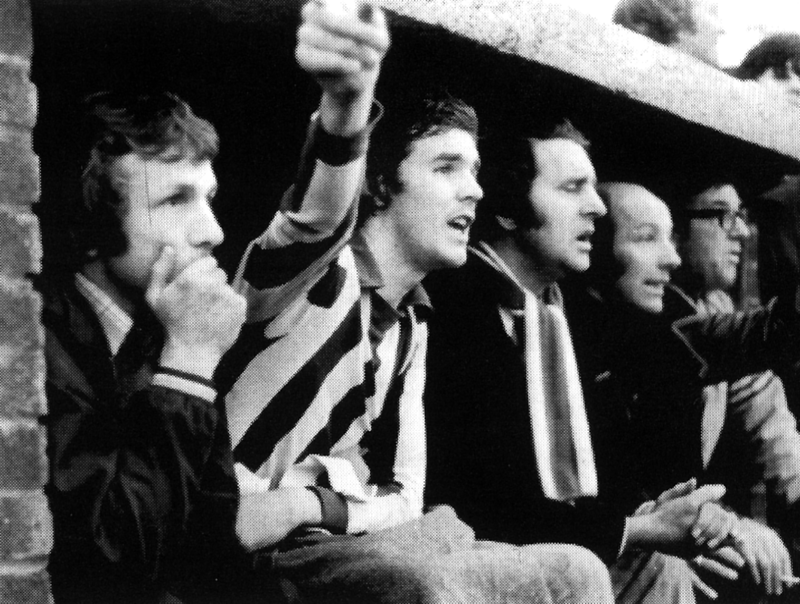 1974 – Bishop Stortford were due to play Miranese but the tie didn’t take place due to organisational problems. Following the abolishon of the FA Amateur Cup in 1974 the English representatives became the champions of the Second Division of the Isthmian League. In 1975 Staines Town beat 1-0 2-0 Banco di Roma 1-0 at home and 2-1 away, then in 1976 Tilbury & Unione Sportiva Sorinese drew 1-1 in both ties and the Italian won 5-3 penalties to become the 1st ever Italian club to win the trophy. Simultaneous to this change in 1975 another competition was created, the Anglo-Italian Semi professional Cup, which had the Italian Semi-professional Cup winners play the champions of the Isthmian League Division 1 (in 1975) and the FA Trophy winners (in 1976). In 1975 Wycombe Wanderers beat Monza 2-1 on aggregate and in 1976 Scarborough beat Lecce 4-1 on aggregate. Both these tournaments disappeared when the Gigi Peronace Memorial (more commonly know as the Anglo Italian Cup) continued as a competition between Semi-Professional teams from both countries in 1976. 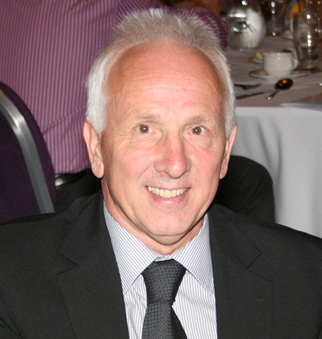 Mike had completed his studies by the time he joined the Spartans and began teaching Chemistry at King Edward Grammar school in Morpeth, he forged a successful teaching career and remained at King Edwards’s until his retirement in 2008. Hugely popular with his students it was during those years he was to forge a football coaching career that would eventually see him turn a highly successful playing career into an equally successful coaching career. Mick instantly established himself as a vital part of Billy Bell’s Spartans side, and his 1st season couldn’t have gone much better with a League & Cup double. Bell proved his undouted Northern League pedigree guiding the Spartans to their 1st ever Northern League title and guided the club to the Northern League Cup Final. Mick scored his 1st goal of many goals for the club on 27th September when he scored the 4th in a 4-1 home win over Stanley United, it was a sign he had found his range as he then scored in the next 3 games, ending his successful first season with 8 goals, he also played a vital role in Blyth reaching the 4th Round of the FA Amateur Cup. “Billy Bell was very tactical. In training we worked on our positional play a lot and where we should be on the pitch when we lost the ball. It was very structured and it was an effective way of playing and we done a lot of fitness training. Billy had a successful record over a long period with many clubs”. Mick’s fellow midfielder Eddie Alder was installed to ‘run’ the team along with club legend Billy Fenwick for the 1973/74 season, under the new management team Mick found the back of the net a remarkable 33 times to finish top scorer. His haul included 2 hat tricks and 1 penalty, but the events of Saturday 27th April 74′ was his finest of the campaign when he hit 5 in the 6-1 home win over Willington. Mick shared the penalty taking duties with Mick Lister, but he had the dubious honour of missing the first penalty awarded that season in the 1-0 home victory over Bishop Auckland on 8th September. Two weeks later Spartans stretched their run to 9 straight league victories with a 5-2 hammering of Crook Town at Croft Park however despite scoring twice Mick failed to record his 1st hat trick for the club when he missed another penalty!. Mick did eventually get his hat trick on the 2nd February in the 3-1 Northumberland Senior Cup victory over Wallsend side Marine Park. The turn of the year saw Mick find the back of the next with regularity and on 27th April he scored 5 (including a penalty) in the 6-1 demolition of Willington at Croft Park. However despite Mick’s goals Blyth lost their Northern League title to rivals Spennymoor United, after finishing level on 64 points a Play Off game was held at Portland Park, Ashington which the Spartans lost 1-2. Mick added another medal to his ever-growing collection four days layer when Blyth beat local rivals Ashington 3-0 in a replay to win the Northumberland Senior Cup. One of Mick’s 33 goals give him the honour of being the club’s last ever goalscorer in the FA Amateur Cup when he scored in the 1-3 defeat to eventual winners Bishop Stortford. 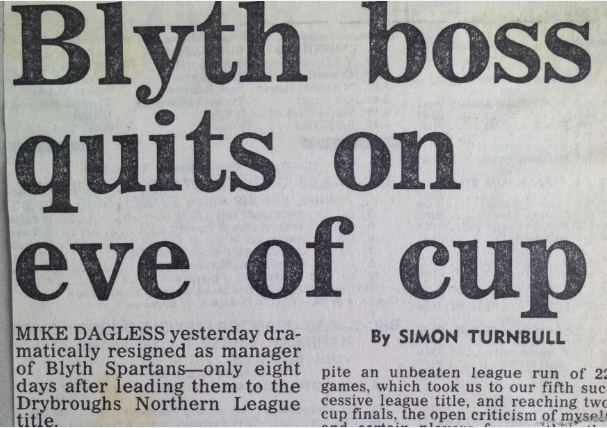 That season also give Mick his first real taste of FA Cup football as a Spartan, having crashed out on the 4th Qualifying round the year earlier Blyth reached the 2nd Round. 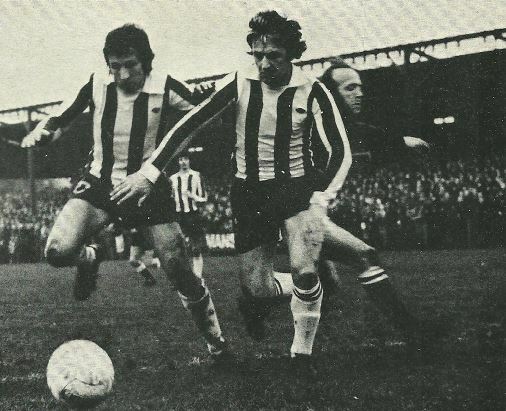 Victories over Netherfield and Alfreton Town (after a replay) saw the club drawn away to Grimsby Town and the Mick starred in his midfield role as Spartans were more than a match for the League side bringing the Mariners back to Croft Park for a replay, which the League side ran out 0-2 winners. Dave Burowski, Alan Cruddace, John Lang, Ronnie Phillipson, Micky Pink, Mick Third, Ronnie Scott, Alan O’Neill. Mickey Pink, Gordon Smith, Eddie Alder, Brian Slane, Mick Dagless, Ian Nixon. A new manager was installed for the 74/75 campaign, into the hot seat came former South Shields manager Alan O’Neill, he made a few changes in the team including bringing in Mick’s former North Shields teammate Mick Morgan. O’Neill’s experience and shrewd acquisitions soon became clear as the Spartans set off on an extraordinary season that saw them regain the Northern League title without losing a single league game. Mick scored 19 goals from his midfield birth however 1 of them stands out in the club’s history. That historic season saw Blyth draw Preston North End at home in an FA Cup 2nd Round tie, what made the tie even more special was that the North End player manager was World Cup winner Bobby Charlton and fellow 1966 hero Nobby Stiles also played for PNE. 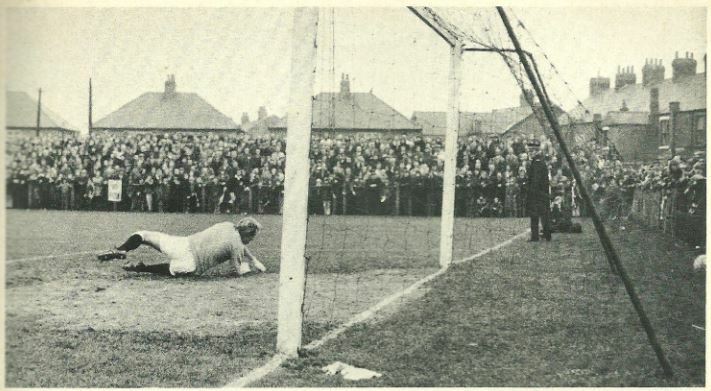 Preston equalised through Mel Holden and went on to win the replay 5-1, however Blyth recovered from the defeat (which denied them a 3rd round meeting with Arsenal) to the win the league wihtout losing a single game all season and retaining the Northumberland Senior Cup. Mick’s superb form was rewarded with selection to the Middlesex Wanderers squad for the summer tour of Malaysia. 1975/76 season saw Blyth retained the Northern League title with Mick scoring 14 times including 4 in the 5-1 Senior Cup win at Alnwick Town and he scored the final league goal in the 4-0 win over Durham at Croft Park that retained the title. It was a season in which Mick learned even more of just how cup competitions are an important part of the club’s traditions, despite cashing out of the FA Cup in a replay at Rossendale United the new Rothmans Challenge Cup brought brand new opposition for the club with away ties at Forest Green Rovers & Clanfield, Blyth played 15 cup ties of which 5 went to extra time!. 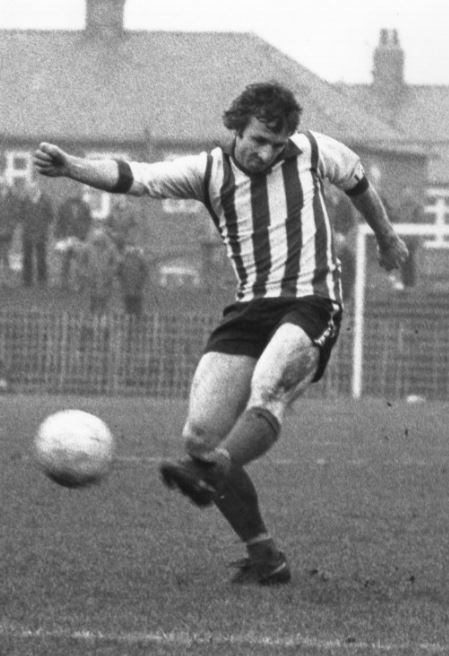 By the standards he had previously set 1976/77 started poorly for O’Neill, a draw with 2 defeats in the first 3 games but the ship was steadied with a 7 game unbeaten run in which Mick scored 2 in the 4-1 win over Shildon. Mick was denied another winners medal to add to his collection when Spartans took on holders Whitby Town in the Rothmans Challenge Cup Final that had been held over for the previous season. The game played at Brewery Field Spennymoor saw Brain Slane score twice but Whitby ran out 3-2 winners. The team results continued to be patchy as Mick scored 4 more goals before hitting 2 in Blyth’s 4-2 win over a Rest of League side at Croft Park in December. A 1-5 at Wearside League Blue Star in the Senior Cup Semi Final really set alarm bells ringing, only 2 more wins came before Alan O’Neill quit in February, his replacement was a teammate of Mick’s: Brian Slane. Slane’s 13 games in charge that season fared little better with only 5 victories, Mick’s final goal of the season came in a friendly on 7th April when Norweigan side OS Turnforening came to Croft Park, Dagless & Hartley Maddison scored in the 2-1 victory. The season did however bring Mick another winners medal to add to his unique collection but this one wasn’t with the Spartans, although it was with many of his Blyth team mates. Mick had been playing in the Durham and District Sunday League for a side that Brian Slane ran in Langley Park. 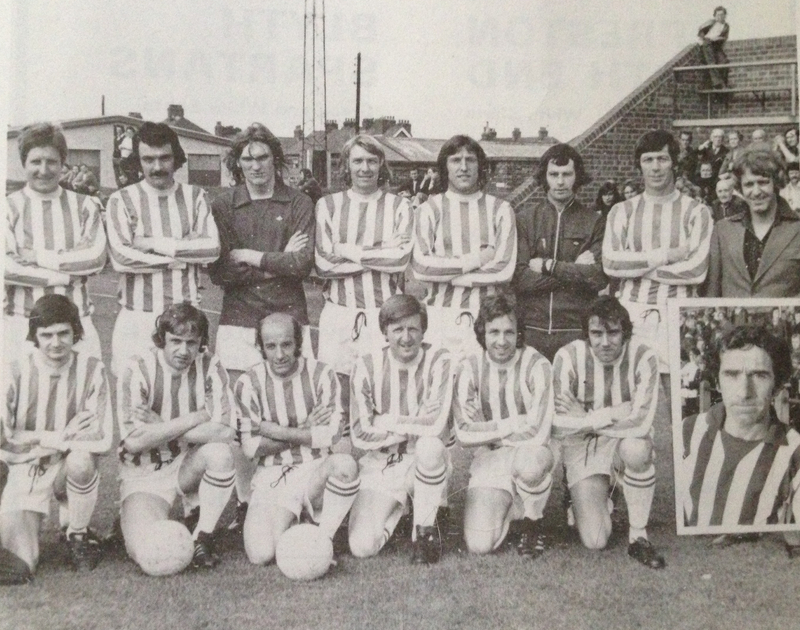 Slane had built a truly formidable side which included well-known Blyth stars like John Waterson, Alan Shoulder, Tommy Dixon & Mick Morgan plus experienced Football League players who had recently dropped down into the Northern League such as Allan Gauden & John Tones. When the Rams Head won the FA Sunday Cup it was seen as a shock to many outside the North East but certianly not to those who knew Slane and his players, they beat 2 times winners Newtown Unity FC from Birmingham 2-1 at the Brewery Field, Spennymoor. Slane’s Rams Head side were hugely successful in the mid 70’s winning the Alan Smith Memorial Trophy in seasons 1975, 1977, 1978 and the League Cup in Season 1977. In 1983 they became Langley Park Welfare and brought Northern League football back to the village for the 1st time since 1929. The original Langley Park had joined the Northern League in 1920/21 and played until 1929/30 season before quitting after only 7 games. In 1990 they dropped the ‘Welfare’ from their name reverting back to the original name but only for history to repeat itself in 1995 when they left the Northern League and folded, a Langley Park Rams Head side reformed and still to this day play in the Durham Sunday League. Mick then played Sunday League football closer to his home along with some former teamates when he played with Ronnie Scott & Eddie Alder for Bedlington Station SC in the Blyth & Wansbeck League, in fact his final playing days was in Sunday League football was with Morpeth St Georges. “Brian had brought in some real quality during the summer. An anxious looking Mick watches the Enfield victory form the bench. 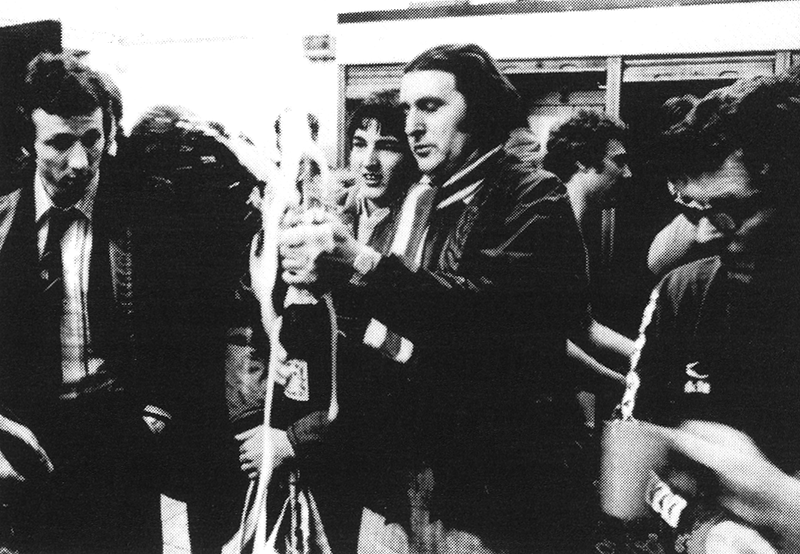 Mick watches Jackie Marks cracking open the bubbly in the St James Park dressing room. However for Mick it was to prove frustrating season, now the established lynchpin in the Spartans midfield he had scored in the 4-1 FA Cup 3rd Qualifying Round win at Consett and then 3 days later bagged a brace in the 8-2 hammering of Whitby Town at Croft Park. However the events 10th December 1977 were to cruelly ended Mick’s his participation in the historic FA Cup run, during the 1-0 win over Durham City Mick picked up an injury which was to keep him out for 2 months. The injury ruled Mick out of the victories over Chesterfield, Enfield & Stoke City but he made his comeback on 11th February in Senior Cup Semi Final 2-2 draw with Whitley Bay. I hadn’t been out through injury before that season and it obviously happened at the worst possible time. I was probably fit by the time we faced Wrexham again in the replay but the team was settled and playing brilliantly so there wasn’t a chance I could get back in. I remember walking out onto the pitch at St James and seeing the huge crowd, from a personal point of view it was sickening to miss the chance to play in such a match”. Mick quickly forced his way back into his accustomed midfield birth and on 2nd May he got to grace St James Park when the Spartans beat North Shields 2-1 in the Northumberland Senior Cup Final, although it wasn’t the same as that famous February night there was a lot few than the 42,000+ inside the ground to see Steve Carney & Terry Johnson score. Mick added another winners medal to his ever-growing collection on 6 days later when Blyth won the Northern League Cup thrashing Willington 5-1 at Appleby Park, North Shields. 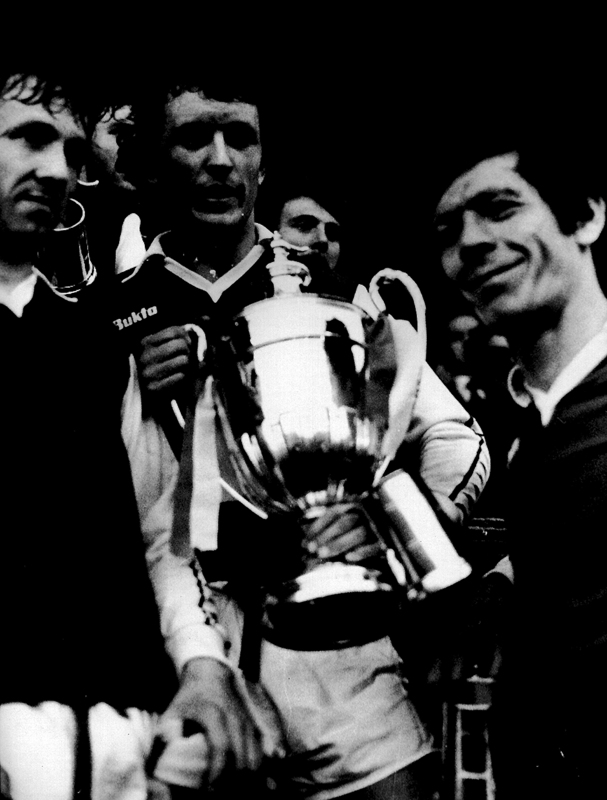 Mick collects the Debenhams Cup with teammates John Waterson & Ronnie Scott. Mick may have been ‘sickened’ to miss the Wrexham FA Cup ties but did get to face them in the final 2 games of that long 62 game season. Come May 1978 Wrexham had been crowned Third Division Champions and both clubs epic cup runs had qualified them to contest the Debenhams Cup. Mick played in both leg’s of the tie, Blyth won 2-1 at the Racecourse Ground and the 1-1 at Croft Park 5 days later which saw Blyth take the trophy 3-2 on aggregate to give the club some small reward for the injustice they suffered at the Racecourse Ground back in February. Despite only losing 1 game since the New Year the Spartans missed out on the League title by 6 points to winners Spennymoor who retained their title despite a 6-1 hammering by the Spartans in the final game of the season as the Croft Park side took their league goal tally to 107!. The following season saw Mick play a more deep-lying role in midfield as the Spartans found themselves up against Football League opposition once again in the FA Cup. However this time there was no giant killing, being drawn away to York City the Spartans were denied a place in the 2nd Round as the Ministermen snatched a 1-1 to earn a replay at Croft Park. On a snow covered pitch the game went to extra time before the Third Division side finally ran out 3-5 winners. 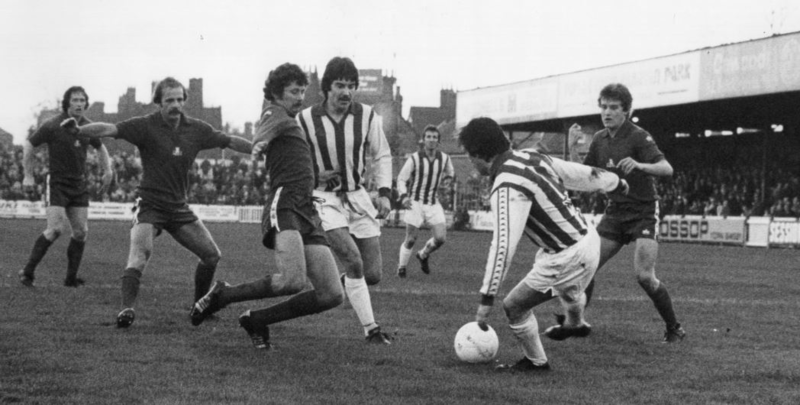 Peter Davies & Mick Dagless watch on as York captain Roy Kay is about to bring down Alan Shoulder for a penalty that Terry Johnson scored to bring Blyth level at Bootham Crescent. Mick was to end the campaign playing under his 4th manager at the club when his long time friend Brian Slane stepped down in December 78′, Mick had played with Brian since he joined the club in 1972 and continuity was kept when coach Jackie Marks stepped up into the managers roll. Marks started bringing in new players but Mick was the central part of his midfield rebuild and the FA Cup brought another League team for Mick to pit his skills against, Mansfield came to Croft Park to face an unbeaten Blyth side who despite being hit by injuries were expected to claim another cup upset. With Mick’s midfield partner Keith Houghton forced to fill as an emergency centre half Blyth never got to grips with the League side who had won an away game all season and they ran out 0-2 winners in front of a 4,433 crowd. Marks continued to strengthen the side and the Spartans went on to reach the 4th Round of the FA Trophy taking eventual winners Mossley to a replay and sealed their 1st Northern League title for 3 years, it was to prove to be the 1st of a remarkable 5 successive League titles. It also proved to be Mick’s last season with the club, his last game came on 29th April in the final game of the season 2-1 victory over West Auckland (his last goal had been in the 2-4 defeat at Spennymoor on 15th December). During the summer of 1980 Mick decided it was time to move on and brought to an end a trophy laden 8 year career at Croft Park, it was a shock to the supporters who had idolised the gifted midfielder and thought the club would struggle to replace a of his style. Mick hadn’t just been using his teaching skills in the class room he was running the football teams at the King Edward’s School and was in charge of the Northumberland Schools FA County Under 18/19’s teams so it was a natural progression into coaching for him and in the summer of 1980 he accepted an offer from the newly formed Bedlington Terriers manager Billy Ward to be player/coach for their first season in the Northern Alliance. Mick was joined by his former teammate Eddie Adler who had been coaxed out of his 2 year retirement for one final swan song at the Terriers. Mick & Eddie helped Bedlington to a 3rd place finish but he only played the single season at the Terriers before he was approached by Whitley Bay manager Micky Clifford to become player/coach at Hillheads in summer the of 1981. It was a struggle at Whitley as they finished the 2nd bottom in his first season however fortunes improved slightly in 82/83 as they finished 13th but in June 83′ there was boardroom upheaval at the Bay with the Chairman Ted Fuller stepping down and Clifford ended his 7 year spell as Manager, with Micky having brought Dago to the club he decided to leave Hillheads. Unsurprisingly Mick wasn’t sort of offers and after 2 years away made a return to Croft Park when Spartans Player/Manager John Connolly moved quickly to appoint Dago as his coach, it was a shrewd move by Connolly allowing him to concentrate on playing with Mick experience on the bench. The Connolly & Dagless management team went down a storm with the supporters thanks to the free-flowing style of football partnership instilled, it saw Blyth reach a Quarter Final of the FA Trophy and won a record equalling 4th successive Northern League title. 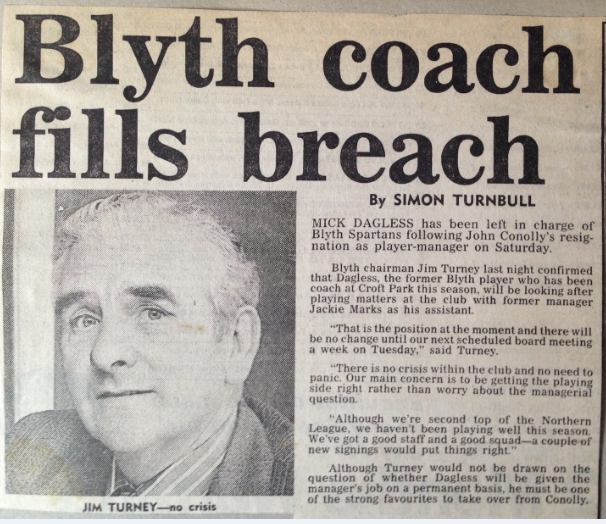 However come the November ’83 season Connolly has expressed a wish to return to playing at a higher level and within weeks resigned his post, only 2 weeks earlier Mick had turned down an offer to become manager of Whitley Bay choosing to stay on as Connolly’s assistant and it proved a wise decision when Chairman Jim Turney appointed 36-year-old Mick temporary manager of the Spartans, it was long before Mick was appointed permanent manager some 11 years after first joining the club, becoming the 7th former player to manage the club. Mick never lost a single league game since he took charge in fact his only defeat as Blyth manager came in an FA Trophy Replay with Whitby Town and even that went down to a last-minute penalty!. However despite completing the league campaign with that record 5th successive title and also guiding the club to their 11th League Cup Final & 4th consecutive Senior Cup Final things had built up behind the scenes. Blyth drew 0-0 with Blue Star in the Senior Cup Final at St James Park then played their last league game at Gretna winning 2-1 to end the season unbeaten in 22 games, but 4 days later they lost 0-2 in the League Cup Final to a Paul Walker inspired Horden CW at Appleby Park, North Shields. It proved to be the final straw for Mick and on Sunday 6th May he dropped the bombshell that he & his assistant Brian Main were resigning with immediate effect!. “We at Blyth give him his big chance to be a manager only last November. All I can say is that this is one hell of a way to repay us for that favour“. “I resigned because I was disappointed with the attitude and open criticism of myself and my players I have brought to the side from certain members of the board. This reached an unacceptable level and it made my job extremely difficult. I know I will be criticised over the timing of my decision there has been so much unwarranted hassle from within the club that there was no point carrying on as manager. I want to very much remain dignified in this matter, but I will say that there are people at Blyth Spartans with whom it has become impossible to work with. The supporters have been excellent in their attitude towards the team since last November and I would like to thank them for that. But I don’t have any regrets about resigning, I am in fact relieved!”. If managing is like this at every club, I would drop out of the game!. I certainly in no hurry to get back into football, but if a reasonable offer came along some time in the future I would consider it”. Mick and his players celebrate after clinching promotion. End of season celebrations for Mick’s Alnwick side, former Spartans Mark Cameron, Ian Mutrie & Gary Middleton watch future Spartan hero Richie Bond take centre stage. Mick did make a return to management with reigning Northern Alliance Champions Morpeth Town but left before Christmas feeling they didn’t quite match his ambitions as a manager. Struggling Northern League 2nd Division side Alnwick Town acted quickly offering him their vacant managers job. He and Brian Main saw a project took up the offer and turned around the clubs fortunes, they were rock bottom and looking doomed with a single victory when he took over and he guided them to 5th bottom and safety in his first season. Building on that they finished 10th in 85/86, and really started to challenge from there one finishing 6th in 86/87 and again in 87/88. 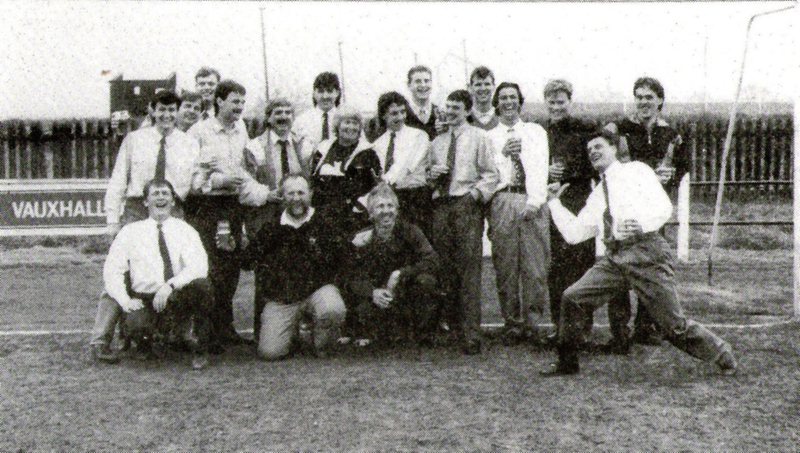 But it was in 1988/89 that Mick’s hard work paid off when they achieved a 2nd place finish on goal difference, to gain promotion alongside 2nd Division Champions Consett & 3rd place Whickham. Mick built side using all his contacts and experience bringing players such as his former team-mates Ian Mutrie & Dave Clarke mixing experience with good young local talent such as youngsters Gary Middleton & Mark Cameron who he took from Croft Park (although both would later return to Croft Park) and the main star of the side a young fleet-footed forward by the name…..Richie Bond! Mick’s side had a superb first ever season in the Northern League First Division making their highest ever finish to a season since they 111 year history finishing 8th, 1 place higher that the Spartans!. The curse of the returning former manager saw Mick twice bring his side to Croft Park and win, in October they beat the Spartans 2-0 in the league meeting and they repeated the feat in January winning a Northumberland Senior Cup Quarter Final tie 2-1 and the main architect of those 2 defeats was Richie Bond!. (The Spartans and Alnwick Town have only ever meet 3 times in league competitions 1946/47 in Northern Alliance, 1989/90 & 1990/91 in Northern League). However the next season wasn’t as good they struggled badly without the services of their star player Richie Bond who had been snapped up by the Spartans in the summer, Mick’s side finished 2nd bottom and were relegated back to the Second Division and Mick parted company with the St James Park club. Mick then accepted an offer to help out his friend Brian Penfold who was manager at Northern Alliance Morpeth Town (Brian was one of his former players while Mick was Blyth manager). Brian & Mick guided Morpeth to the Northern Alliance title in 1993/94 but they both walked away from Criak Park the following season after a fall out with Chairman Ken Beattie. It was to be his last involvement with club management and he then devoted his free Saturdays to watching Newcastle United. It wasn’t just in the world of football that Mick’s talent’s were so highly thought of, he was extremely popular teacher with all his students, his style of teaching left an impression on many of his student an example of which was recently shown by Professor Alfred William Rutherford. Mike’s performances in a green and white shirt are still remembered fondly by those who saw his exquisite skills. It wasn’t just on the terraces where Dagless was so greatly revered either be it his teammates or his student he is recognised as a class act and the mark of the man that he is so highly spoken of. Andrew Dodds co-writer and interviewer for the original match day programme version of this article. Mick Dagless himself for helping with this article. Chris Sanderson for his memory and knowledge of the local game. Neil Pont & Alan Head of the Northumberland County Schools FA for their help. Alan Matthews Chairman of North Shields FC for this help with information & images of Mick’s time at North Sheilds. Michael Cook for this help with information & images of Alnwick Town FC. Martin Hunter for his records of Blyth Spartans goalscorers. Ken Sproat who’s superb history book ‘We’re the Famous Blyth Spartans‘ is a great source of reference. This entry was posted in FA Amateur Cup, FA Cup, Green & White Cult Heroes, Players and tagged Alan O'Neill, Alnwick Town, Anglo-Italian Cup, Bedlington Terriers, Billy Bell, Blyth and Wansbeck Sunday League, Bobby Charlton, Brian Slane, Chemistry, Coppa Ottorino Barassi, European Amateur Cup, FA Amateur Cup, FA Amateur Cup goals, FA Sunday Cup, Jackie Marks, King Edwards School Morpeth, Langley Park FC, Midfielder, Morpeth Town, Newcastle University, Nobby Stiles, North Shields FC, Northern Alliance, Northern Combination League, Northern League, Northern League 2nd Division, Northumberland Senior Cup, Peterborough United, Preston North End, Promotion Goal Difference, Rams Head, Teacher, Tommy Orrick. Bookmark the permalink. Cheers RQM, articles take so to research and put together. I always have several in the go (2 currently half written) its just finding time to finalise them.